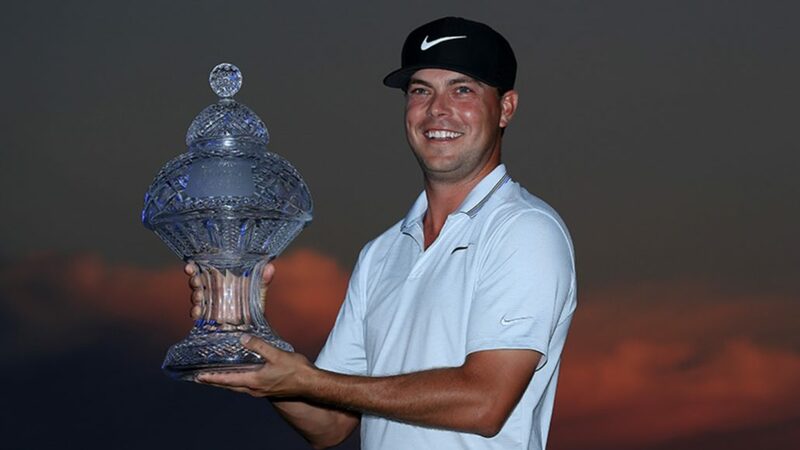 Keith Mitchell made a 15-foot birdie putt on the final hole Sunday to win The Honda Classic for his first US PGA Tour victory. The final putt was enough for a 3-under 67 to finish at 9-under 271 at PGA National, a single stroke ahead of Brooks Koepka and Rickie Fowler. Mitchell was tied for the lead after 36 holes, and was tied for second going into Sunday. He birdied four of his final seven holes for his first win as a pro, including stints on the Web.com Tour and PGA TOUR Latinoamerica. All he had to do for that victory was hold off two of the game’s best in Koepka and Fowler. Koepka shot a 66, and Fowler a 67. They both birdied the 18th and Fowler had a huge charge late to get to 8-under – with three birdies in his final four holes, including a 45-footer on the 17th. But Mitchell didn’t waver in the wind. He was on the upslope of a fairway bunker about 205 yards from the pin for his second shot at the par-5 18th. All he could do from there was hit a pop-up, leaving him with a wedge in for his third. That checked up about 15 feet below the hole, giving him a putt to win. He made it, pumped his fist and waited for the final group of Wyndham Clark and Vijay Singh to finish about five minutes later. Ryan Palmer (63) and Lucas Glover (66) tied for fourth at 7-under. Charl Schwartzel finished in the group sharing 16th after a final round 69. The South African struggled on the front nine (36), and once again with his work from the tee, but recovered with a strong inward run (33) to move up 16 spots. Schwartzel hit just six of 14 fairways on Sunday, but upped his work with 13 of 18 greens hit in regulation.